For 27 years Randy has called Bozeman, Montana home. 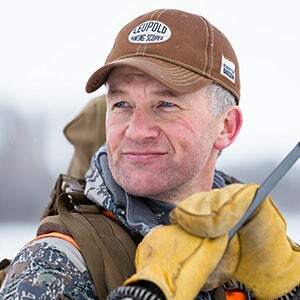 He has been active in the hunting media since 2008 and is a committed member of conservation and public land advocacy groups. You may have seen his TV show “Fresh Tracks with Randy Newberg” or listened to one of his podcasts. Randy’s day job as a CPA specializing in complex estate and trust work supports his outdoor addiction, and he can often be found with his partner-in-crime, his wife Kim, by his side. Father, Grandfathers(s), Uncles - I still hunt and fish for the food, for the connection to the natural world, and for the freedoms those activities provide me. I am a hunter, therefore I hunt. Research, practice, organize gear, develop a plan. I get to hunt 100+ days per year, so I have to be organized and dialed in to keep our operation producing hunting media content year-long. Being with my son when he shot his first bull elk. Everything else is a distant second. Bugling bull elk with a bow on the public lands of the west. So many sunrises and sunsets that cause me to wonder how it is that I am lucky enough to be born in the greatest country in the world, America, where even a kid from the wrong side of town could grow up and be a hunter if that is what his heart desired. Mountain caribou in northern British Columbia. Lyle Lovett, Patty Loveless, old country music, binos, a bow, a shotgun, a rifle, spare coat, extra water, phone charger, GPS, hand sanitizer, dog biscuits, two spare tires, jumper cables, tow strap, sunglasses, TP, and lots of candy. Hunt when you can, you're gonna run outta health before you run outta money.